With Enterprise Strategy Group (ESG) now projecting 90 percent of businesses to spend as much or more on Cloud services of all kinds, it’s not surprising that Forrester expects the public Cloud market to hit $191 billion by 2020. Cloud is attractive to many, but there are still obstacles. These include security concerns, integration challenges and unclear cost models that bode well for on-premises infrastructure. It is important to note that Cloud adoption will compliment, not replace on-premises infrastructure. The expectation is that Cloud will become an increasingly large part of that market, especially as a compliment to on-premises transactional systems. 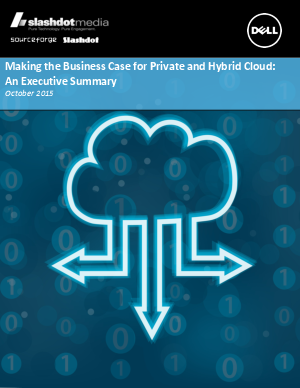 In August 2015, Slashdot Media and Dell produced a TechBytes webinar series that outlined the business benefits of adoption of private and hybrid Cloud strategies. This executive summary provides an overview of the webinar discussions, as well as a link for readers to view the TechBytes series in its entirety.